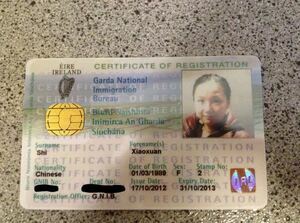 Xiaoxuan Shi lost it in Dublin city centre yesterday and would love to get it back. Ignorance Is Bliss Have You Seen Schrödinger’s Cat? I Found A Dog Do You Know Jennifer Caine Visiting From Massachusetts? Posted in Misc and tagged GNIB Card, lost at 2:12 pm on April 19, 2013 by Ewok.